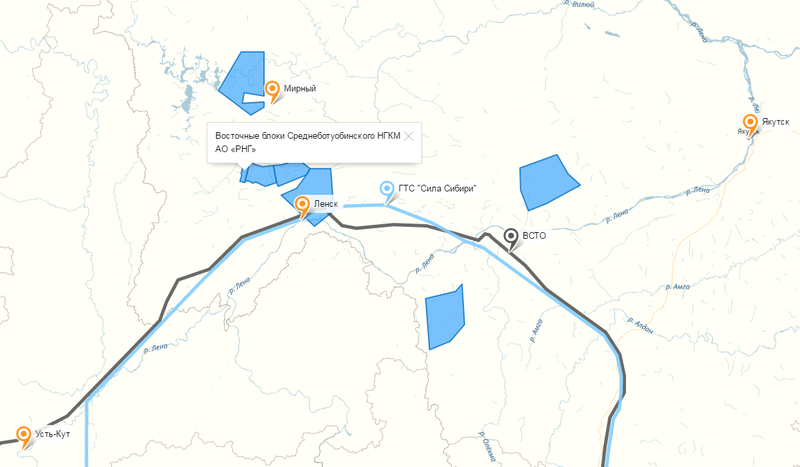 The Srednebotuobinskoye oil and gas condensate field (OGCF) is situated in Mirny District of the Republic of Sakha (Yakutia), 130 km south-west of Mirny and 140 km north-west of Lensk. 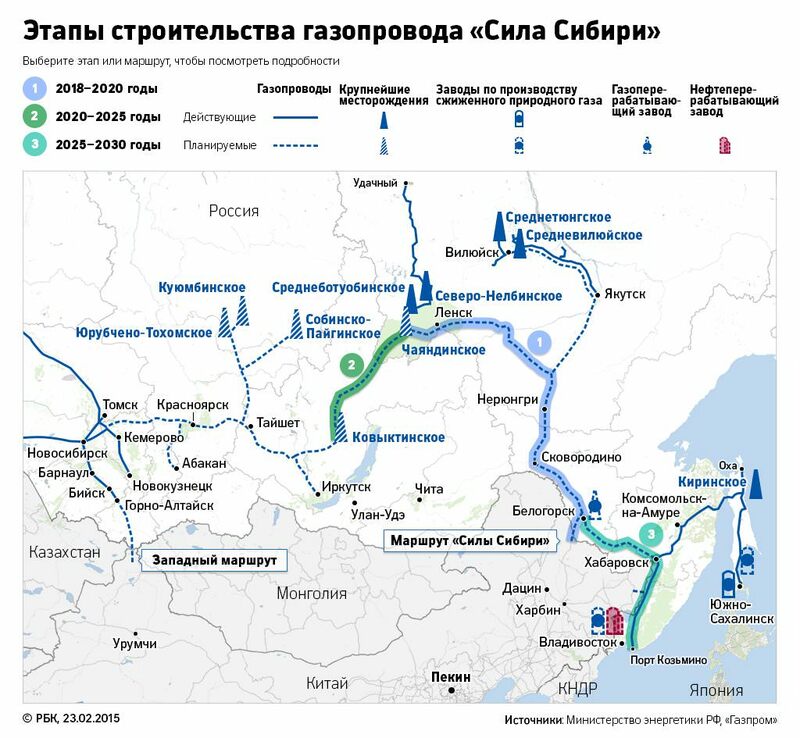 Produced oil will be delivered to the Eastern Siberia – Pacific Ocean (ESPO) pipeline system in accordance with the received tie-in specification. 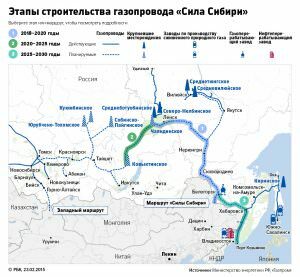 The short-term plans call for the completion and start-up of the Power of Siberia gas pipeline, which will run 150 km from the Eastern Blocks of the Srednebotuobinskoye OGCF. RNG holds Subsoil Use License No. YaKU 04493 NE issued September 3, 2015 for the exploration and production of hydrocarbons within the Eastern Blocks of SB OGCF. The license is valid till December 31, 2029. The licensed area is 385.5 sq. km. 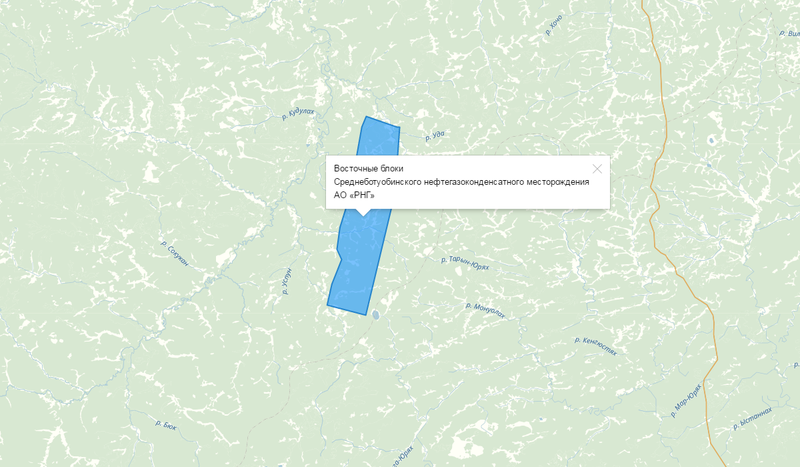 85 km south-west of SB OGCF is the Chayandinskoye field, which is of strategic importance for the creation of the Yakut center for gas production and supply of gas to China via the Power of Siberia gas pipeline. Tectonically, the field is divided into three large blocks: Central Block, Northern Block, and Eastern Blocks. The field is divided into four license areas. Geographically the field is located within Lena-Vilyui plain, Central Siberian Plateau in the interfluve area of Lena and Vilyui in the mid-channel basin of Ulakhan-Botuobuya river (right tributary of the Vilyui river). The river is unnavigable; the only time the navigation is possible is during spring-summer flood on small motor boats. The annual stream flow is 120-130 mln. 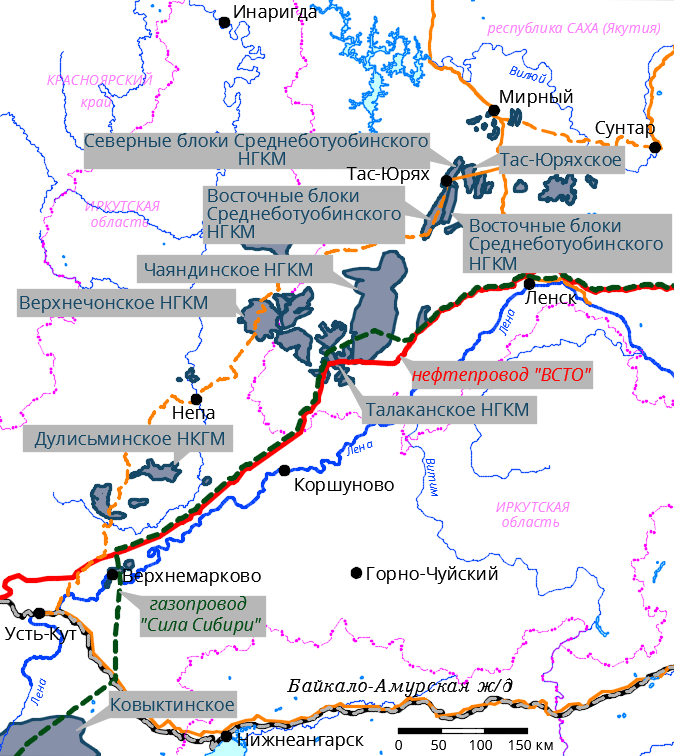 m.
The hydrography of the region is also represented by Tas-Yurekh river and some smaller rivers. They are mainly the snow-fed rivers. River and stream valleys are swampy – approximately 10% of the territory is occupied with bogs and marshy lands. Ice forms in the first decade of October, the breaking up of the ice takes place in the late April, in the early May. The biggest ice thickness on non-freezing rivers reaches 120 cm. The relief represents a hilly terrain, divided by dense network of temporary streams. Absolute elevations of the relief are of 300-390 m, relative heights - 30-50 m.
Mirninskiy district climate is extremely continental with long harsh winters and short warm summers. The main factors influencing the severity of the climate are deep continental location and the mountains surrounding the plain from the east, south-east and south impeding penetration of the moist air masses from the Pacific Ocean. The particular severity of natural conditions of the region is determined by winters of 7 months length with clear weather and low temperatures. Average monthly temperatures of the air in January are steadily within –28°С –40°С. Often enough the freezing temperatures in winter reach 53-57°С below zero. The average length of heating season is 270 days. There is almost no spring and autumn. Hot days in summer (temperature rises to +30°С) give way to cold nights. Average monthly air temperature in July in Mirninskiy district varies from +12°С to +18°С and the maximum is 33°С - +35°С. There are little precipitations in the region; the soil dried during the summer is sparsely watered and freezing late in September, it is covered with snow in a dry condition. The snowing is characteristic for the region in October-November. Thickness of snow on level surface lots is about 35-50 cm. Quantity of days when the soil is covered with snow is 200 per annum. The main feature of geotechnical conditions of the field is universal development of perennially frozen rocks, embedded to a depth of 400 m. The biggest thickness of seasonal melting of 3.5-3.9 m is characteristic for watershed areas covered with pine forest. There are outlets of the construction materials, namely brick clay, limestone, gravel, sand, gypsum, quarry stone and dun stone on the area of the Eastern Blocs of SB OGCF and in proximity thereto. There is a building timber in the region in the form of separate boscages. Notwithstanding significant potential of the Eastern Siberian natural resources, hydrocarbon reserves are still mainly undeveloped in this region due to its geographical remoteness and severe climate conditions. Poor road infrastructure in the region complicates both transportation of the equipment to the field and transportation of the production therefrom. 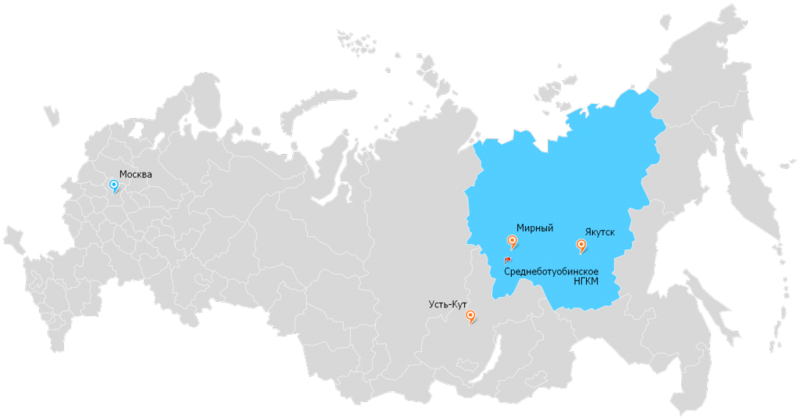 Presently the main form of transportation is the Baikal-Amur federal railway to the town of Ust-Kut (station Lena, port Osetrovo) and then by barge to Lensk (the water route length – 961 km). 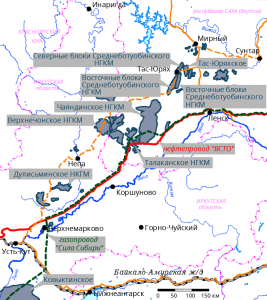 The problem is to be solved with a substantial contribution of the oil pipeline ESPO and gas pipeline “Power of Siberia” which according to the project will pass near ESPO. 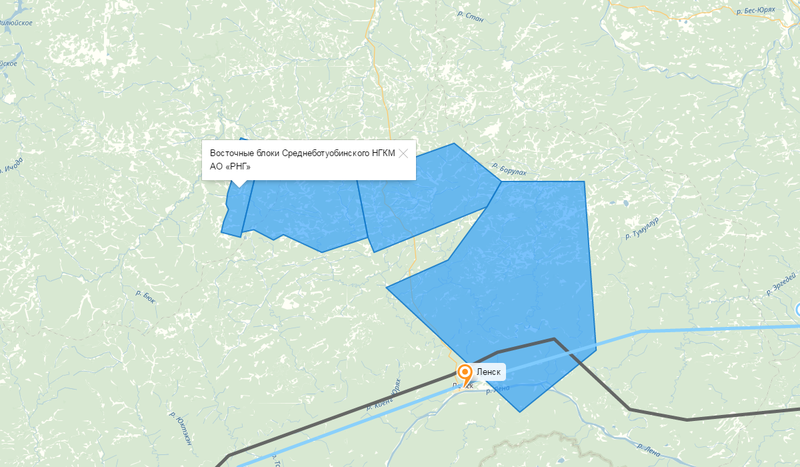 The pipeline “Power of Siberia” is located at a distance of 150 km from EB SB OFCF.